Today I finally found a reason to get a Pi. Raspberry Pi to be precise. Here Morgan is printing a case for the Raspberry Pi, while under control of the bumblebee app, running on said Pi. It also handles the Webcam. All of a sudden the Top-end Morgan is not the one sporting the SD card, or the display. Of course the machine would be dependent on availability of internet connectivity, unless you have your own server. 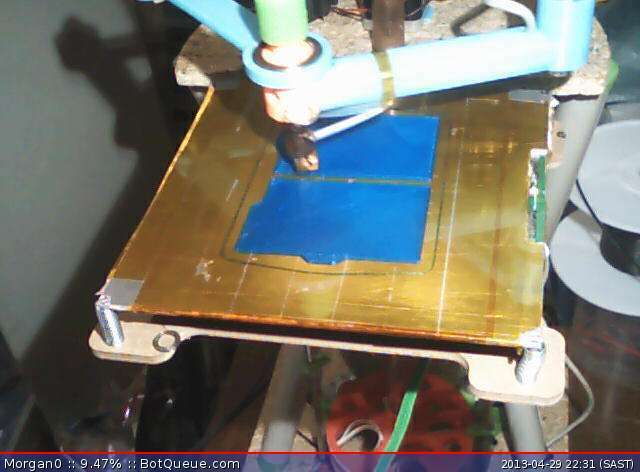 I have clocked 55Hr of printing since installing BotQueue. Printed most of the parts for another Morgan (Aluminium version) and a Mendel90 for a fellow hacker. I have to get the new Morgans into the farm as soon as possible. So much to print! Please don’t forget to include us in the list.